Tuesday, February 12, 2019 - Fast fading gospel singer, Bahati, has been exposed by a close friend and fellow musician identified as M4J. Bahati and M4J have known each other since childhood from the time they grew up together in Mathare slums. They even formed a group called Bone Breakers before he got a breakthrough and forgot about his childhood friends. 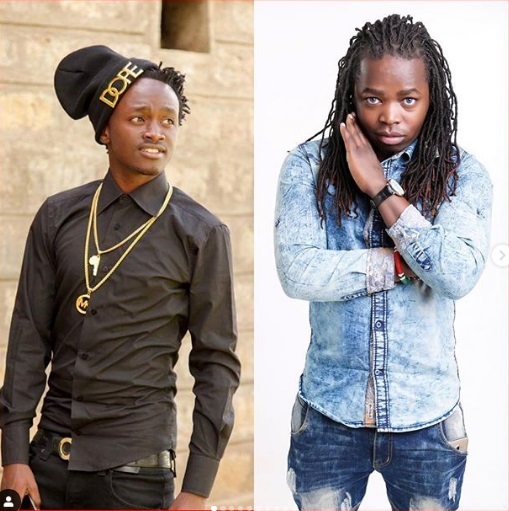 M4J has written a series of posts on Instagram where he exposes Bahati’s dirt. He even reveals how the controversial singer who is going down so fast has been lying that he grew up in a children’s home to get money from donors. Follow this post by M4J to know the real Bahati. Out of a simple group God formed in my Hands (Bonebreakers) has come an entire three Quarter of todays Gospel fraternity. nimemfundisha Kudance. Kuimba. Mpaka Kupray. so Namjua Poa sana. i have regarded Him as my Son. And at any Point the Group was Contributing any amount for a show or uniform for dance, i never allowed Bahati to do So, i always Catered for his Part. So siongelei mtu nimejua Jana, and other Group members can attest to this. So when bahatis breakthrough came things changed, il not go into so much details, im not here to bring "Being Bahati" down im here to speak out and Square this like He wanted. i have called him more than enough, akiona simu yangu its like anashikwa na Marasmus, he hangs up. i have tried reaching him through diffrent people Anilipe my monies with no fruits. Personally im not looking for publicty as others may judge, Sitafuti kiki i have been there i have enjoyed the Goodness of the lord in my days and ata ivo Kiki hailipi Rent kiki sio Bundles, so As i said im here An eye for an eye. Fast forward Miaka Zimepita, Bahati Made it, never talked to me for 3years which wasnt a Must, i never Called him either sii You know we Luos, "Jaluo Oksechi" if you know, You know.. 😆💦🤦🏻‍♂ i was Happy for the Ninja, i always big him up and Supported him Check my FB page Youl see posts i did those days and i never Expected much from Him. When Bahati was launching his Album He needed Tshirts Printed to be sure 150 tshirts, launch was at NPC valley road. so i stoped doing some of my clients Job to help a brother, a son, Since it was me, He sent Mutua who is also my Son a Very Disciplined guy, a member of BONEBREAKERS by then KINGS OF DANCE ARENA, for those Who attended Jesus Night can 2nd this. So i did the Tshirts with 30% paid, i went to my Pockets and made sure this Ninjas launch was going to be successful. So i left in dispair and disappointments i tried to reach Bahati days, Weeks, months, years. And i stopped i had no choice bt to forgive Him. Baus!!! Now it was Like a Movie, pata Potea, Hit and run. ignoring my calls, hanging em up, and i said its Okay. One Year later I met bahati intown and he was like ooh bro!! ooh!! iv been through alot i spent all on studio and blah blah blah, i said isorait You are Family. I was among the Artistes to Perform ofcourse im on the Program iv been pushing the posters online (swipe pics to see poster). while back at my office after i did the event wristbands, bahati said “Jambo pay” will sort me deposit which they did and the rest after Show. waaaaaaa 🤦🏻‍♂ if yo looking for a patience guy im here, so i checked time i was to be at the airport soon, i asked the stage manager ******** what about after the countdown she Told me it was time for all the emb signeees to Perform. 😡😡😡So dissappointed i went to my Car and drove off to Airport stright mimi huyu Mombasa mji Wa Raha, pwani manenos, 😆💦 i did my Show and came back to Nairobi. days later Bahati hashiki simu, My fans who knew i was to perfom were so much concerned Dm after dm. but it was hard even to explain. So nikachorea Io Story nikacheza chini. Now Here is the most Uncalled for thing Bahati Did to me. 2018 shortly before i left 254 i released my Song *BADONANGOJA* now a well crafted video, Co-incidentally i met bahati and @jibrilblessing at Ronalo foods in Nairobi Town and i was excited i have a new song, so i showed them and asked for their opinion, remember the Song is 2weeks old on Youtube [ M4J - BADONANGOJA], so bahati looks at @jibrilblessing and smiles as he says hehehe na zinafanana ukweli, jblessing says bt "video ndio tufanye dfrent kidogo" sikuget io vibe poa but it never clicked my mind anything was cooking behind my back. 1week later without wasting time bahati was launching a new artiste called rebeka soki, i was bussy at work so i did not attend i went later intown and met friends who praised the song but One Artiste called and asked me Have You listened to that song rebeca sang?? i said no, he said kimbia youtube and hanged up. When i logged on YouTube, oh my God!! i didnt believe my ears, my song was copied stollen and given to rebeka to sing, How sad was that men. i cried faul no.1 gave an ear even the big wigs. infact i was told to keep quiet. After days and days of trauma, i forgave bahati only for Him to call me one evening after work and he Abused me and Said "nisimletee izo story zangu, nisimdrag into my issues and yeye anajua io ni Uchawi"
Imajin some of my interviews for my media tour were cancelled i investigated and bahati was Behind a couple of them. i felt bad for soki who later was chassed away from emb like a burkenge. 2months later i left 254, Started working on my Youtube Acc then Bahati goes to NGOMMA VAS and an insider Tells me that Bahati gave out Some handout and has been showing up randomly for My YouTube channel to be Removed from NGOMMA VAS, indeed it was Removed which now my YouTube is Independent. iv seen it all with this Guy. God is faithful. But so far Legally Bahati has my Debt, I need My Money Baba Mueni, Nataka Pesa yangu Kevin Kioko Bahati. @mrseedofficialUkisema huyu boyz hajakulipa i can relate. whichever the case let my longtime friends who knows me n bahati get to see the reason as to why "mtoto wangu" hajawai ji associate na mimi after making it. PART II loadiiiiing..... i thought i should put this Here to some Some Healing.